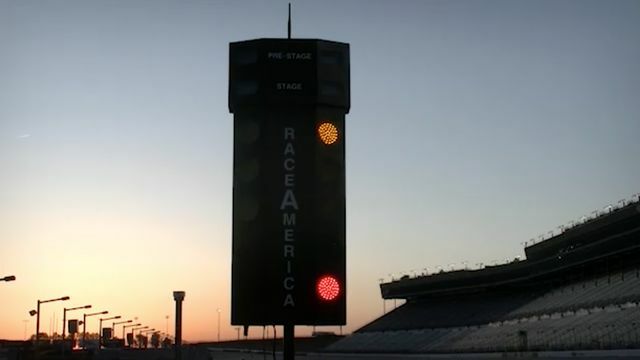 Atlanta Motor Speedway has added an upgraded starting-light tree, as well as an automated finish-line winner light to the famed pit-lane drag strip, as the 12th season of O'Reilly Auto Parts Friday Night Drags, one of the nation's largest organized street-style drag racing series, cranks up with its opening night this Friday. The new starting tree features a sleek, new design and LED bulbs for a crisp, bright color to signal launch-time for drag racers. Meanwhile, the automated finish-line winner light utilizes a system of lasers to determine which car in either lane crossed the line first, removing any possibility of human error. "That's something we've really been looking forward to," said longtime competitor David Harbin. "It takes the mental part out of it as there is someone [the light] down there we can rely on every time and there is not going to be any bias. Either you win or you lose." Once the first vehicle crosses the finish line, an overhead light will illuminate above the line, signaling lane of the victorious driver. Simultaneously, the starting tree will illuminate with flashing colors on the side of the winning vehicle. "It's nice stuff," said Kevin Mayo, driver of the 1969 STP Chevrolet Nova. "The LEDs light up. It gives you a better feeling knowing that it's a beam down there as opposed to someone flipping a switch to denote the winner." Atlanta Motor Speedway's popular street-style drag racing series, O'Reilly Auto Parts Friday Night Drags, returns this Friday night, kicking off its 12th season of high-intensity, side-by-side competition on the famed pit-lane drag strip. Drags will also include the weekly Show-N-Shine competition, with seven divisions of judging between cars, trucks and motorcycles. Show-N-Shine participation is $20 and also allows entrants to participate in the weekly Speedway Cruise on the 1.54-mile AMS racing surface following judging and prior to the start of drag racing eliminations. Vehicles from the Show-N-Shine will also be displayed on the frontstretch following the Speedway Cruise.